Home > Newsroom > News Releases > Wow! It’s Parks and Recreation Month! Wow! It’s Parks and Recreation Month! CORPUS CHRISTI, TX – Are you ready to discover everything Corpus Christi Parks & Recreation has to offer? Want to celebrate parks, play and endless possibilities for fun? 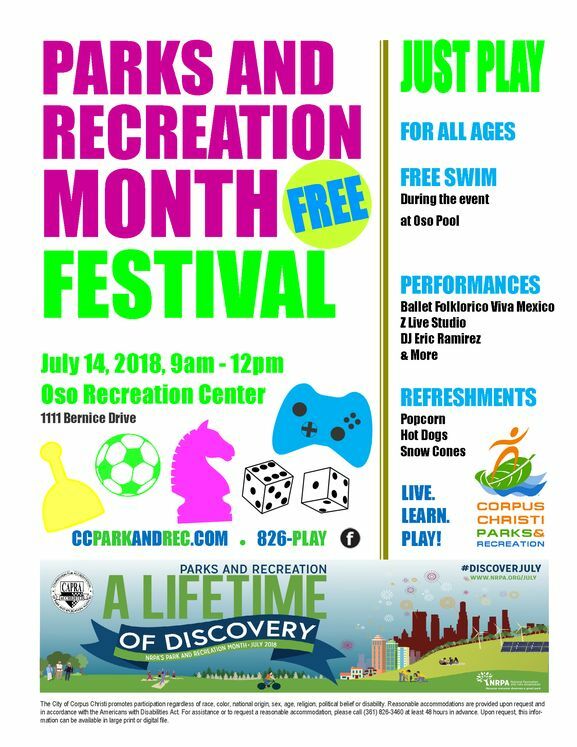 Then come start your lifetime of discovery on Saturday, July 14, as we swim, let loose and share more about our many programs during the FREE Parks and Recreation Month Festival! Festivities will take place from 9am - 12pm at the Oso Recreation Center, 1111 Bernice Drive. Community members of all ages are invited to come out to join the celebration, take a dip at Oso Pool and enjoy performances from Ballet Folklorico Viva Mexico, Z Live Studio, DJ Eric Ramirez and more. Popcorn, hotdogs and snow cones will be available while supplies last! For more information, call the Corpus Christi Parks & Recreation Department at (361) 826-PLAY or visit www.ccparkandrec.com. We invite everyone to Live. Learn. Play! Reasonable accommodations are provided upon request and in accordance with the Americans with Disabilities Act. For assistance or to request a reasonable accommodation, please call (361) 826-3460 at least 48 hours in advance.